We are delighted that the Bishop of Hertford has agreed to lead our Eucharist service and will be joining us afterwards in school. We are very pleased to have such a special visitor lead our worship, and visit our school. 40 days, 40 reflections, 40 challenges to make a difference! Join forces with a global, generous community of over one hundred thousand people who have completed the 40 acts challenge during Lent. Please be aware that there are very serious online safety concerns about hacking into YouTube videos (including Peppa Pig and Fortnight) online with horrible images, and other violence-provoking content. There are a number of articles in the press regarding this. Please see the National Online Safety advice below to support you. We will also provide information on the newsletter. We are planning our next Messy Church activity session for children and families on 7thMarch. This session will be a Pancake Day theme. It would be really good if you could offer to help and support the activities. If you are able to help, it means that more activities can be organised. Please let the office know if you are able to. We are planning to make some changes to the school day in a positive move to improve learning behaviour and also support attendance. There will be a trial change to lunch times next term to see how the sessions would run. We will be finishing lunch at 1pm instead of 1.15pm to add in some well-being activities for children, and provide more learning activities within the school day. This will also mean that we will be gaining time in the curriculum so will be able to finish earlier at the end of the academic year on Friday 19thJuly. At parent consultations we will have more information about this and the changes we are proposing for the following year. These changes are designed to support opportunities when holidays can be taken at cheaper times, support mental health and well-being, and reorganise the valuable learning time during the school day. The Year 6 Young Apprentice committee presented to the judges in the Young Apprentice competition last week. The children had to talk about their business plan, marketing strategy and money raised at the Christmas Fayre. They were also ‘grilled’ by the three judges. The children presented very well and our Year 6 children won two awards. These were for the most money raised and best business initiative. You will be pleased to hear that a group of our Year 5 children came 3rdin a Maths Challenge competition this week. The children were Ayan, Wonder, Funmi and Aryan. A number of local Hertfordshire schools took place with schools from different areas, and Holy Trinity managed to be the top of the Herts schools at the competition, and we came 3rd overall! Well done to the children, amazing mathematicians! Safer Internet Day 5th February 2019. Children’s Mental Health Week – 4th – 10th February 2019. We always take mental health seriously and provide our pupils with a wide range of opportunities to talk if they need to or want to. There are a number of resources available online for parents and carers (see below). If you would like further support from the school or are at all concerned please contact the school. We never take a decision to close the school lightly and it is made on the basis of children’s safety. To open the school we have to ensure that we have an appropriate number of teachers at the school by the start of the day, and that the site will be safe. Therefore if we have concerns in these areas we will need to take a decision to close the school. The school website will have a message on this home page. Local radio stations broadcast details of school closures. The text messaging service will also be in use. Please ensure your details are up to date. A notice will be placed on the school gates if we can, and unless the weather is really extreme. Dates for the new term. Date Event Time Who is involved? All collective worship starts at 9.05am, unless otherwise stated. Please make sure you are prompt otherwise you may not be able to join us. Thank you to everyone who attended our Messy Church activity. there were over 50 children and their families. Rev’d Teresa and I were really pleased that so many people came. Thank you to you and the staff supporting. We are planning another session after Christmas and look forward to getting you involved! Next week is Anti-bullying Week, and the theme this year is Respect. The focus is on online safety, making parents, carers and children aware of the issues around how to stay safe online and how to avoid cyber-bullying. We will be updating the website with the latest information. On Monday (12th November) children can wear odd socks for Odd Socks Day. We will also be reminding children about talking to trusted adults at home and at school if there are issues (not just those online) they are concerned about, what information they should be keeping private, and the sorts of things which might make them unsafe. During last term’s Prayer Days children wrote and decorating prayer bricks for the front entrance. These are now on display and look amazing. If you are in school at any point, please do come to the front entrance and have a look. The School Travel Safety Team have launched a campaign about keeping safe in the dark – ‘Dress Bright and Be Seen’. Please have a look at the information below. This is especially usefulas the clocks go back this weekend. 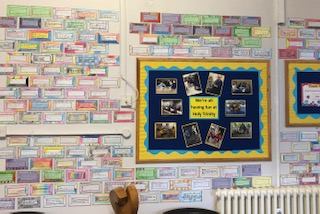 This year we are launching a list of experiences which we would like our children to have the opportunity to complete by the time they leave in Year 6. This is ‘The Holy Trinity 100’ as we would like to have 100 activities listed. The idea is that we look at what enrichment activities we currently provide, and then update or add to them to provide pupils with a wider range of opportunities for personal development. Experiences like these have a really positive impact upon their self-esteem, self-confidence and resilience. Please remember that the after school provision is Energy Kidz from September 2018. Parents and carers will need to contact the club if they need this provision as the school will not have staffing to cater for this. We do not have the staffing to accommodate regular lateness.You will need to register and book directly with them. The club was launched on Tuesday 4th September 2018. The provision runs from school finish at 3:15pm (3pm for Reception) until 6:00pm (although they will be flexible depending upon train times), a snack is served. Unfortunately it is flat rate as their policy will not allow for shorter sessions. We are pleased to announce the launch of our new after school club which will be starting in September. Information is available now for booking. You may be aware that from May, the rules around data protection are changing. The ‘General Data Protection Regulation’ (GDPR) will change how we can use your personal data and keep it safe, and will also strengthen your rights over your own data. The point of this is to make sure sensitive or private information about yourselves and your children stays safe. Whilst it is similar to the current Data Protection Act in many ways, there are a few differences, so we need to make a few changes to our privacy notices in order to ensure we remain compliant. We have updated our privacy notices and policies in line with the changes. These notices have been sent out to parents and carers. If you have any questions about how the GDPR affects you, or how our school is preparing, you can contact our Data Protection Officer dpo@holytrinity.herts.sch.uk or via the usual school contact details. We are graded as a good school with outstanding features. We are pleased that the hard work of the school has been externally recognised. We are proud and pleased to have gained a silver award for the quality of our RE. We are now working towards Gold in the next year to 18 months. Well done to all the children and staff. Our SIAMS inspection report has now been officially published. We are delighted with the outcome and the feedback about our school and community. The report has been sent out to parents and carers today. We have introduced a new service – ‘School Gateway’. This means that you will be able to make online payments via the School Gateway smartphone app or website. You will also be able to view school meal balances and top them up at any time. Holy Trinity has launched our new Twitter account (see to the right of the page) that can be used to keep up to date with what is going on in school. The Twitter address is @HolyTrinity1952. Ethos and Aims of Holy Trinity CE School. At Holy Trinity School we believe in the concept of lifelong learning and the idea that both adults and children learn new things every day. We maintain that learning should be a rewarding and enjoyable experience for everyone; it should be fun. The primary aim of the school is to help each pupil reach his or her full potential so that they may develop the attitudes, skills and knowledge to take full advantage of the opportunities available in their future lives. fostering the values, attributes and lifestyles that a Christian faith demands in the family, among friends, in the school and in the wider community. providing an appropriate balanced education designed to help each pupil reach their potential. ensuring that all staff have access to development opportunities in keeping with the needs of the school and individuals’ expertise to enhance the educational opportunities for our children. nurture the partnership role between School, Governors, Parents,ChristChurchand the wider community for the benefit of the children we are jointly responsible for. These are underpinned by the British values of democracy, the rule of law, individual liberty, mutual respect, and tolerance of those of different faiths and beliefs. Here are some useful websites to support learning at home.